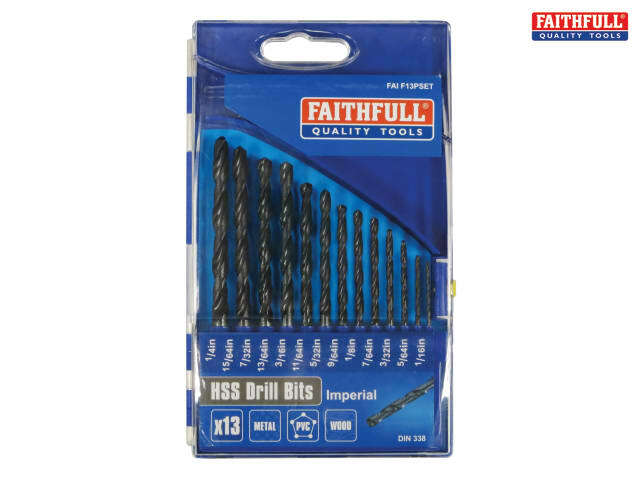 The Faithfull Imperial HSS Drill Bit Sets are designed for cutting metal, however they are also suitable for drilling holes in timber, chipboard and plywood. The sets have an easy flip open action case with transparent front for easy checking of contents. 7 Piece F7PSET: 1/16, 3/32, 1/8, 5/32, 3/16, 7/32 and 1/4in. 13 Piece F13PSET: 1/16, 5/64, 3/32, 7/64, 1/8, 9/64, 5/32, 11/64, 3/16, 13/64, 7/32, 15/64 and 1/4in. This set contains commonly used sizes from the imperial range. Although designed for cutting metal, HSS drills are also suitable for drilling holes in timber, chipboard and plywood.